It's Time For Christmas Easy Piano edition features all your favorite songs including those unforgettable Johnny Marks tunes from the animated television special “Rudolph the Red-Nosed Reindeer”. 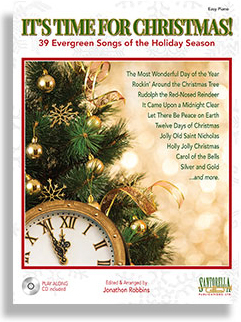 This 128 page collection of 39 early grade arrangements of all your holiday favorites contains lyrics and chord symbols, and includes a play along CD. This wonderful songbook will help any aspiring pianist enjoy the holiday season.